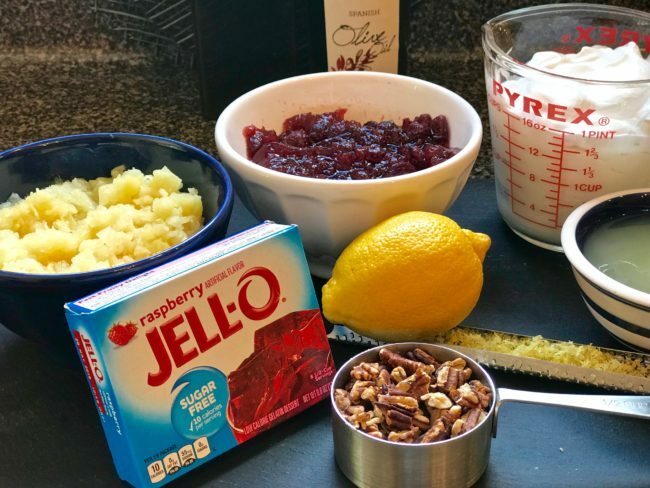 Here is an easy make-ahead recipe for your Thanksgiving menu. 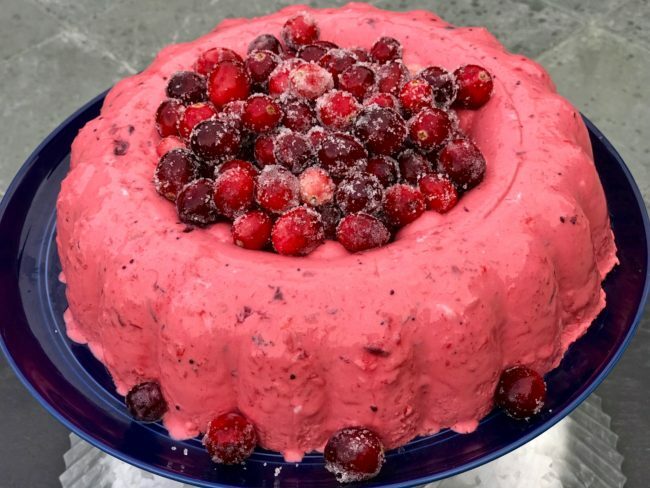 This dessert was shared with me by our friend, Helen, who brought it to Thanksgiving dinner a few years ago, and we now always request she make it. 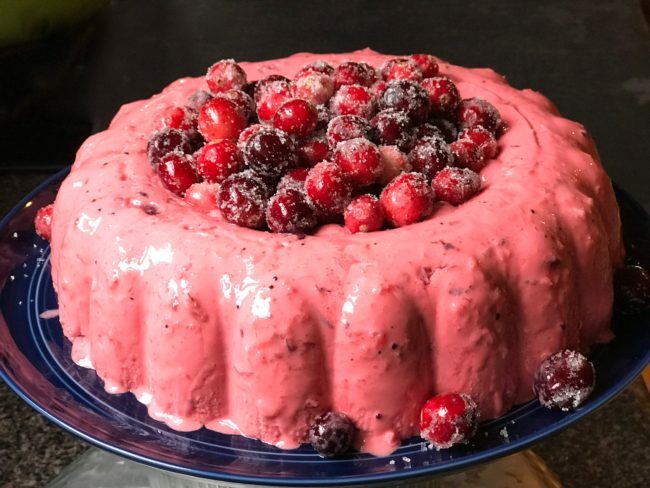 When I was a kid, my Nana used to make a carrot pineapple Jell-O ring for Thanksgiving which I have to admit I’d never eat. I’m not sure what I had against carrots as a kid, because I love them now. I would also never eat the carrot cake that she made, which is DELICIOUS and one of Tom’s favorites (I’ll have to share that recipe someday). Tom, on the other hand, grew up with Jell-O dishes (must be that whole 1950s childhood thing). 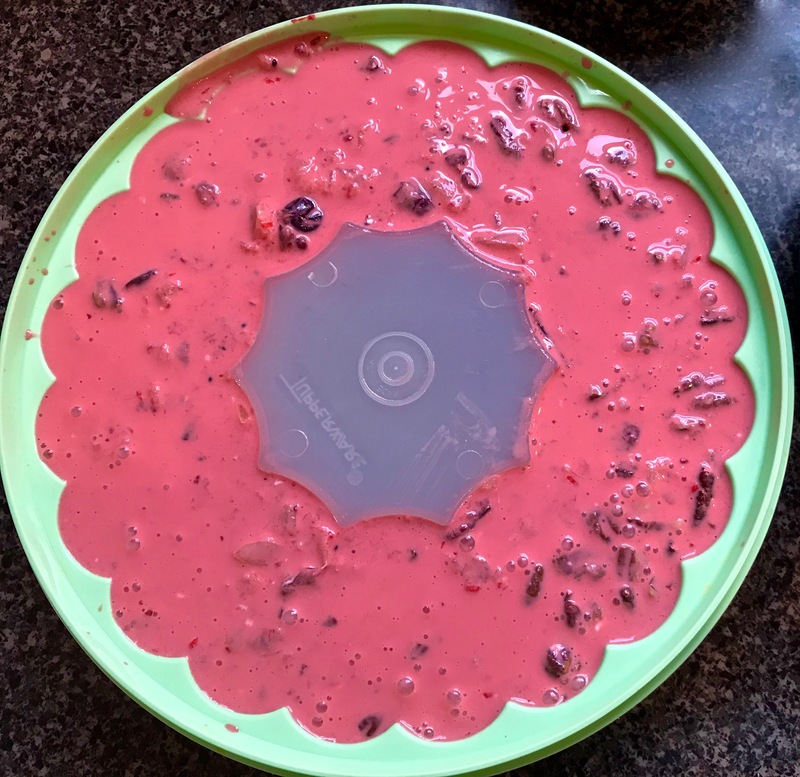 His mom had a big collection of Jell-O molds and recipes. Until Helen brought this to Thanksgiving, Tom’s favorite had been Orange Sherbet Jell-O. Now it’s a tie. This is perfect for either a side dish or a dessert, plus it looks pretty. (If you use a mold with a hole in the middle, fill it up with whipped cream. 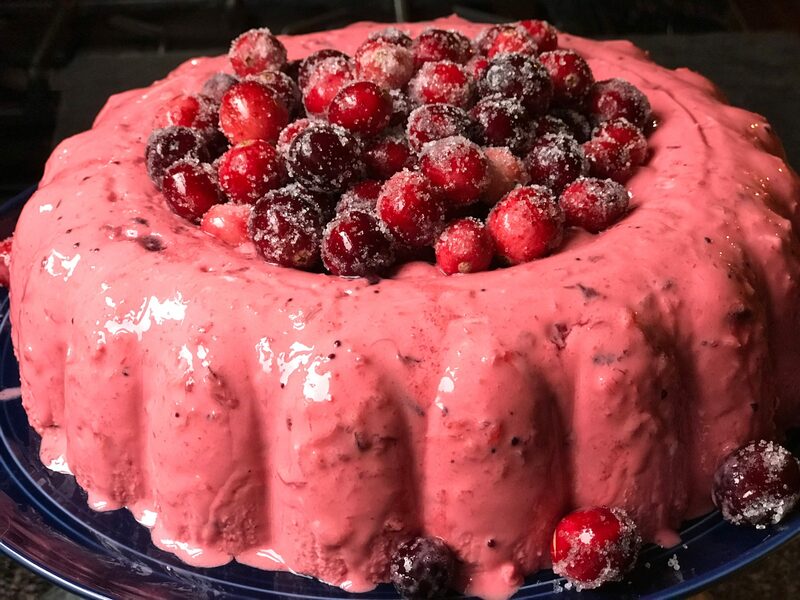 I used sugared cranberries for this photo, but they are a tad tart to eat raw.) Enjoy! Strain the pineapple juice into a separate container and save the juice! (I used a mesh strainer to get as much juice out of the pineapple as I could.) In a large saucepan, combine the pineapple juice, water, and Jell-O. Heat to boiling, stirring to dissolve the Jell-O. Remove from heat. Stir in the cranberry sauce, lemon or orange juice, and zest until well combined. Refrigerate until the mixture thickens slightly (about 1 hour). Fold in the sour cream, drained pineapple, and pecans. Pour into a 2-quart mold. Chill until firm or overnight. Unmold onto a serving platter.